What was life like before Route 66 - The Mother Road? Where did the Santa Fe Style of wearing large amounts of turquoise and silver jewelry together start? Where did the popular southwest motor car tours into Indian Country, lead by female couriers get their start? Who propelled Native American made art and items into mainstream America? Who was the catalyst of hiring women in the American Workforce? How did most European families get started in the southwest? Who started chain hotels and restaurants in the United States? What's the history of that elegant hotel and restaurant, El Tovar, on the south rim of the Grand Canyon and the La Fonda in Santa Fe, New Mexico? Who defined the best customer service in dining across the southwest? Fred Harvey and The Harvey Girls ... and all this history started right here in New Mexico! One extra fashion note: You may be wearing custom made Fred Harvey Jewelry! The Harvey Girls will be special guests at New Mexico Fashion Week's Expo and Runway Shows at the Albuquerque Convention Center. ​Adding a historical and community presence to NM Fashion Week, the "Girls" will be there to greet you and share the history, and the future, of the Fred Harvey Legacy. The Harvey Girls helped tame the Wild West, starting in 1881 at the Harvey House dining hall in Raton NM. More than 100,000 women served as Harvey Girls until the mid-1900s, leaving home and family behind, and relocating to the southwest. 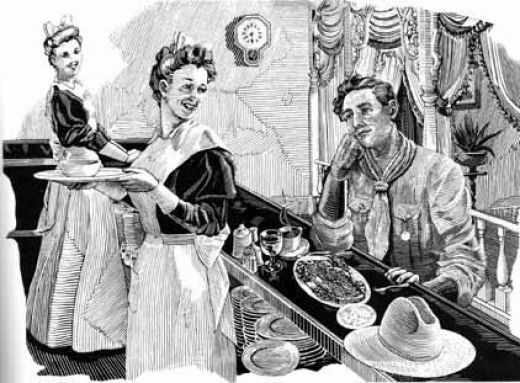 There they served hospitality the Fred Harvey Company way...one plate, one cup at a time.